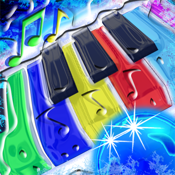 Try a completely new, original, fun, exciting and relaxing music and game experience with the sounds of your Aqua Piano! Compose your songs or play the music game. Two apps in one! Are you ready for this great music experience? * High quality Piano sounds (3 different sets available). * 8 beautiful backgrounds to use. * Background music loops to accompany your compositions. * Classic and Level game modes. Two difficulty levels to ensure longevity. * Music AI to create virtually infinite music compositions for game mode. Each match is new and different! * Beautiful graphic, with Retina display on iPhone 4. * Playable for everybody and anybody! Really fun for all ages! Play and dance to the sounds of your Aqua Piano! * Compatible with both iOS 5 and iOS 4. Thanks for using our products. App Store reviews are greatly appreciated, thank you.